The Tiger style is characterised by its extensive footwork, acrobatic kicks, low, wide stances, and unique fist position (where the thumb is curled in the same manner as the other fingers, rather than wrapped around them). 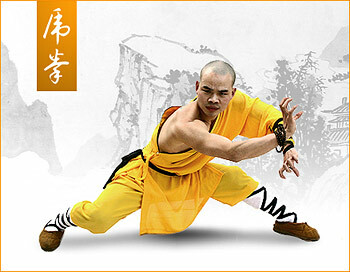 According to Master Shi Yan Xiu, this style is the most externally focused style in the Shaolin arsenal. The longer the student practices, however, the more he or she will come to rely solely on internal power. The focus of the White Crane style is to make less use of physical strength, stressing evasion and strategic attacks to vulnerable areas instead. This style is especially well-suited for women's self-defence as it is not purely strength-based. The Snake style is on the fluidity of the movements. Straight punches, butterfly palms, the hook, upper cut, and back fist are the primary cornerstones of this technique. Thrusting fingers resembling snake attacks is one of the distinguishing features of this form, hence the name "Snake Style." There are multiple kick techniques including below-the-knee kicks. There are six fist sets, two stick sets, single sword, short double swords, and other traditional weapons. The Leopard style is on speed and angular attacks. The leopard does not rely solely on strength like the Tiger, but instead relies on speed and outsmarting the opponent., The Leopard practitioner will focus on his or her elbows, knees, low kicks, and Leopard punches in order to build speed. The Dragon style is based on a variety of fighting techniques that can be employed for a wide range of needs. The style uses techniques that can cripple or kill an opponent if the need arises or it can be used simply to control a minor street fighting situation. Dragon Style training involves an extensive amount of iron body training. Hardening the forearms especially is considered essential for this style. Master Shi Yan Xiu uses a range of traditional training methods to toughen the body. The Praying Mantis style focuses on "sticky hands" - the use of the forearms with the elbows tucked into the chest, the claw-like fingers and the quick explosive actions visually resemble the movements of a praying mantis preparing to strike its prey. Monkey style is one of the more acrobatic styles. Movements often include falling, lunging, grabbing, jumping, and tumbling. The staff plays a prominent role in weapons training, with practitioners using it to attack, defend themselves or climb it like a pole in order to gain a height advantage during combat. The flamboyant movements and sometimes comic actions of the monkey style have made it a popular style.